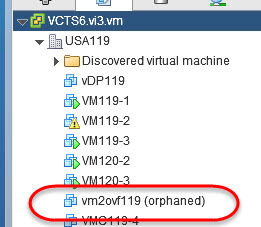 So, I was testing out our new lab environment this week for the VMware Authorized class; vSphere Install, Configure & Manage 6.5, when I realized the current version has the student inadvertently create an orphaned VM. The interesting thing is how it happened and what the resolution is. 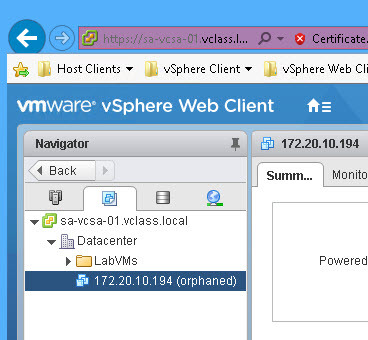 So, we have a VCSA 6.5 vCenter and 2 ESXi 6.5 hosts joined to it. The lab manual has us build a nested VCSA VM to run through the installation of VCSA. AS soon as you get the VM setup, they have you delete it. 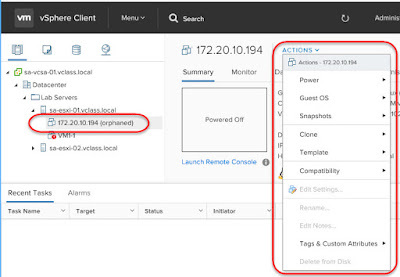 BUT, they have you use the new embedded Host Client which debuted in ESXi 6.0 with Update 2. OK, so how do you remove it from inventory when there are no options to do so. Well, thanks to KB 1011468 https://kb.vmware.com/kb/1011468, we have a workaround. On the left pane, right-click vCenter Server, click New Folder and provide an alpha-numeric name to the folder. Click the virtual machine and while holding the left mouse button, drag the virtual machine to the folder created in step 3. Right-click the folder, and click Remove. The folder and its contents are deleted. This KB is OLD, so in Step 1 in vSphere 6.5, you might see a problem ... There is no Windows based vSphere Client available. 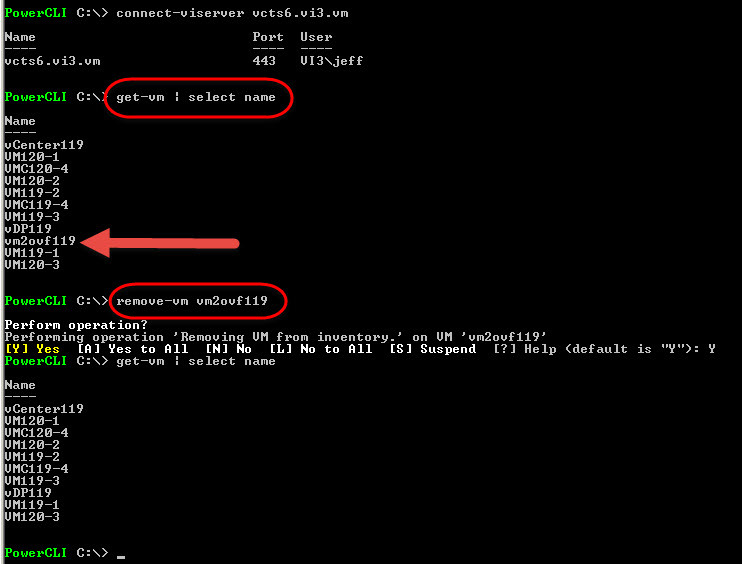 But hold it, the KB shows support for vCenter 6.5, how can that be? Well, here's a little known fact. 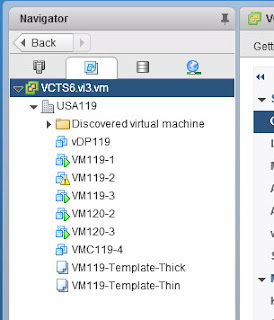 IF you have the 6.0 Update 2 version of the OLD Windows based vSphere Client installed, you can actually use it to connect to vSphere 6.5! 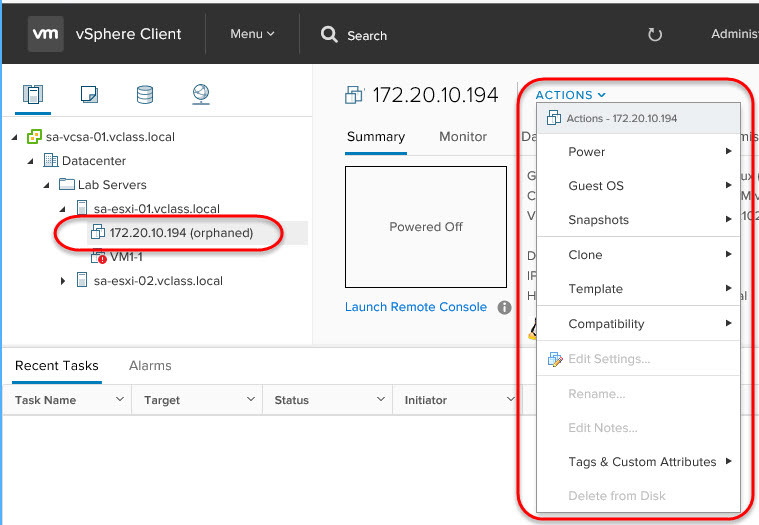 Well, kind of, you CAN connect to an ESXi 6.5 host but NOT a vCenter 6.5 server. So again we are stuck. OK, so the real answer is to use the command line. 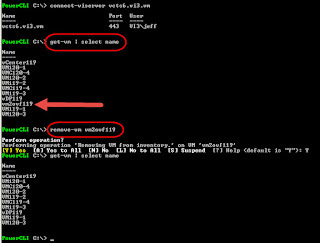 You need to remove the VM information from the vCenter database. Re-run the original command to verify it's gone and view the inventory! And you can see the VM is now gone from inventory! So, I've mentioned to my students before, although you can do the vast majority of what you need using a GUI, you may need some command line skills to do certain things when the GUI is lacking. 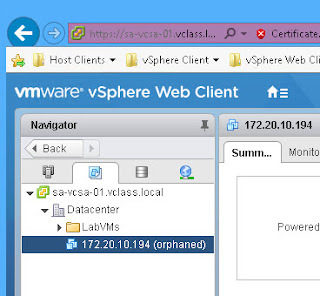 Never too late to learn PowerShell with PowerCLI for vSphere 6.5!